The 28th Arnold Classic was held in Columbus, Ohio on March 3-6, 2016. The inaugural IFBB Arnold Pro Men’s Wheelchair contest was part of this year’s event held at the Greater Columbus Convention Center and the Battelle Grand Ballroom. The Presenting Sponsor was Europa Sports Products. 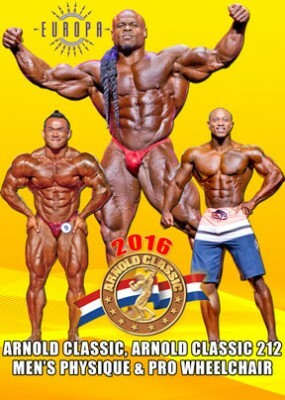 In the Arnold Classic Pro Men’s Physique, BRANDON HENDRICKSON of USA took out the title. The DVD commences with the complete Pro Men’s Physique, Pro Men’s Wheelchair, then the Arnold 212 Prejudging and Finals followed by the complete Pro Men’s Prejudging and Finals. Also the awards to the Arnold Strongman Classic competitors.